The richly articulated facades of this 9-story apartment building are neatly contained by rounded corners at the sidestreet and, unusually, midblock. Although the building is missing its cornice, usually a design disaster, it remains quite attractive. The cornice was rather unusual in that it was highly articulated with tall, pointed cartouches, or anthemia. The red-brick building, which has a two-story limestone base and a beige-brick, third story, was erected in 1910. It was designed and built by William B. Franke and remodeled by the Excelsior Savings Bank to designs by J. M. Berlinger in 1935. It was converted to a cooperative in 1990. It now has 61 apartments. The top floor has very attractive decorative spandrels. The building has a four-step-up entrance that leads to very interesting, wrought-iron entrance doors that lead to a step-up lobby and some decorative balconies. It has no doorman, no concierge, no roofdeck and no garage. 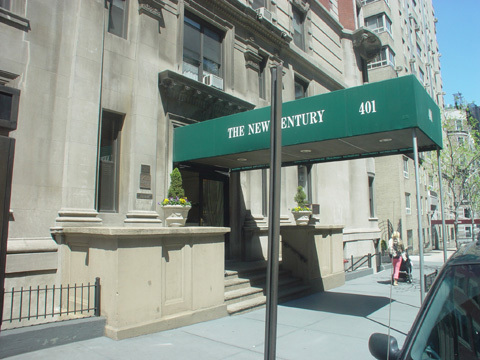 In his fine book, "New York's Fabulous Luxury Apartments with Original Floor Plans from the Dakota, River House, Olympic Tower and Other Great Buildings, (Dover Publications, Inc., 1987, Andrew Alpern notes that the building's original, very handsome, colonnaded, entrance porch is missing. "This building is distinctive both in plan and in outward appearance. The facade is a curious combination of styles. The entrance porch is Roman and the balconies and quoins Italian renaissance. The corners are rounded in the French manner, while the anthemia above the cornice line are pure Greek. The original floor plan...was unusual for a middle-class apartment house in that it provided separate freight and service elevator entrances to each apartment as well as additional master bath facilities. The circulation pattern for each apartment was more straightforward than most, with an entrance hall, off of which opened the major rooms, and a single straight inner hall leading to the bedrooms. A small garage for the residents' automobiles was provided adjacent to the building on 79th Street. In 1942, the appendage was converted for use as a synagogue....Unhappily, the original 10- and 11-room apartments have been cut into smaller units, seven to a floor, and the facade mutilated through the removal of the cornice and the entrance porch," Alpern wrote. 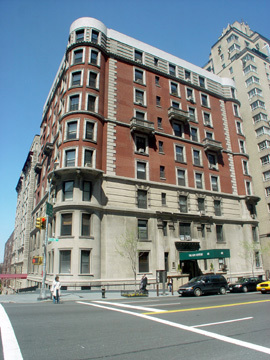 The building's location is excellent as it is one block east of Riverside Park and one park west of a local subway station on Broadway. This neighborhood has excellent shopping as well as many interesting restaurants.